*Go straight to the FULL REVIEW. The Toyota Camry is the dominant midsize sedan in America. Together with the Honda Accord, it defines the segment. For 2018, Toyota strategically messed with success, creating an all-new car, but one that is also very familiar. Those looking for a V6 will be happy to hear that it returns in the Camry, unlike in the new Accord, which moved to lower power 4-cylinder engines, even in top trims. At the other end of the spectrum, the Camry’s new hybrid again makes impressive fuel economy gains coupled with great off-the-line torque. Across the board, from fuel economy to power, Camry’s new drivetrains top the specifications sheets in the class. Inside, the Camry retains its familiar Toyota family look and moves in the direction the Avalon went four years ago. The Camry has a great glass area and excellent visibility. We found no blind spots. The dash is now driver-focused and has a non-uniform instrument panel area. The seats are wide and comfortable, and there is ample room in back for two adults to sit comfortably, or for three to ride on short trips. The feeling of quality is apparent in every aspect of the interior except the infotainment system. That seems more mainstream-affordable. The gauges are excellent, and calling up things like the pressure in each individual tire is easy to do. The seats in our $34,507 tester were heated but not cooled. A heated steering wheel is not available. The 2018 Camry’s new base 2.5-liter four-cylinder engine has 203 hp and earns a great 32 mpg combined EPA rating. That is a huge 5 mpg jump from the 2017 Camry. The base Camry’s fuel economy is 1 mpg higher than the new 2018 Accord’s. The Camry Hybrid comes two ways. There’s an mpg-optimized LE trim with a crazy-high 52 mpg combined EPA rating, and the XLE/SE trims with an impressive 46 mpg combined rating. 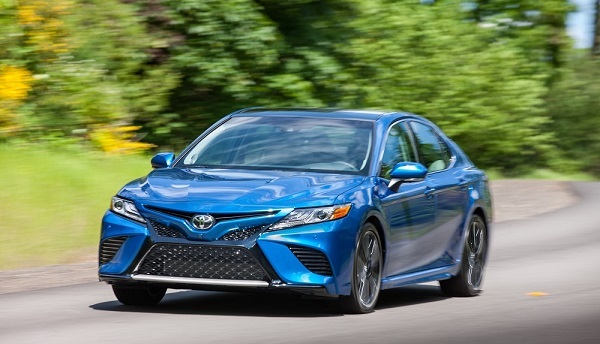 The V6-equipped Camry trims also get great mileage with a 26 mpg combined EPA rating. The V6 Camry has 301 hp. That is 49 hp more than the top 2018 Accord’s horsepower. The Camry actually matches the 26 mpg combined fuel economy of the top two Accord trims. Toyota hit a home run with the Camry’s new drivetrains. Even though power is up across the board, so is fuel economy. Every Toyota Camry uses regular unleaded fuel. In many electric vehicle target markets, like Massachusetts, the Camry Hybrid LE has a lower cost per mile of gas than most electric vehicle’s cost per mile of electricity (based on today’s prices). When Toyota shifted to its new platform it took the handling up a notch. The Camry handles as well as any car in its class now, including the Mazda6 and new Accord. The 301 hp V6-equipped Camry can run from 0-60 mph in under 6 seconds. That’s as fast as anyone really needs to go in a front-drive sedan. (That’s faster than a 1990 Camaro Z28 and many Corvettes from the 1950s through 1980s. Are we saying a Camry is as thrilling as a sports car? Of course not, but it is far from the most mundane car in its class. 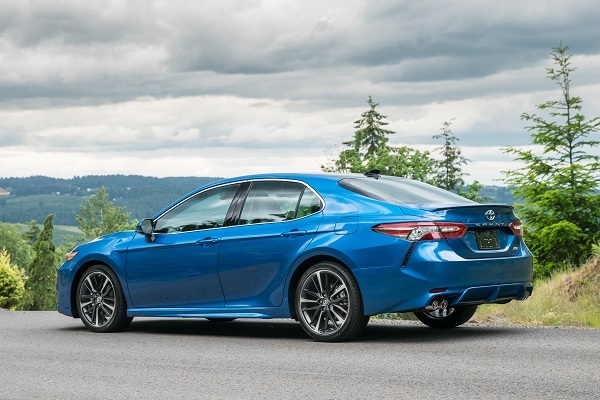 Those interested in the best driver’s Camry should check out the V6-equipped XSE. However, we’re not sure you really need the V6. In normal driving, the base four-cylinder is great. The Hybrid is even better. With 5 more hp, but a lot more torque at start-up, the Hybrid XLE trim is snappy. Camrys have been called boring by so many auto writers. The fact of the matter is that, at the Camry’s price point it’s one of the quickest cars in America and every 2018 model feels fun to drive. The improvements to the new Camry are not just about power either. Over the winter-beaten roads in New England on which we tested the Camry Hybrid XLE, it was smooth and quiet. Even big potholes didn’t jar the vehicle, and in corners with bumps, the Camry still feels planted. 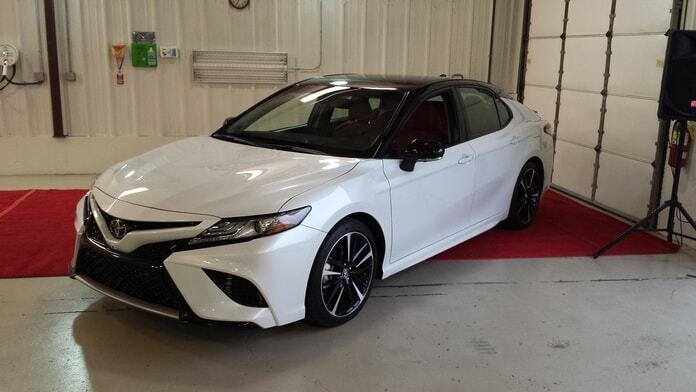 We could sense the solidity of the new Global Platform that Toyota has moved the Camry to for this new generation working to help the ride quality. Our XLE Hybrid had performance-oriented, all-season, 18” tires and handled great too. Steering was sharp for the segment and brakes were excellent, with almost no hybrid weirdness due to the regeneration system. The Camry is not a sports car but is enjoyable to drive, and in its segment, just as much fun as the Accord and Sonata. Toyota has added some visual flair without adding any accents that will turn off most buyers. The new platform allows for a smoother ride and will help Toyota earn top safety scores for the full duration of this generation. The infotainment system in our $34,507 tester was a disappointment, but check back in 2019. Based on seeing the 2019 Avalon, we have a sneaking suspicion that Toyota may make some changes buyers will appreciate. The new Accord is a great car as an alternative to the Camry and has its strong points. Based on our testing, the Hyundai Sonata and Kia Optima are well worth a look for those who want premium features like a heated steering wheel, and Apple Car Play and Android Auto. Hyundai and Kia also have excellent quality ratings. Long the safe purchase, the new Camry has much to offer a broad range of midsize car shoppers. 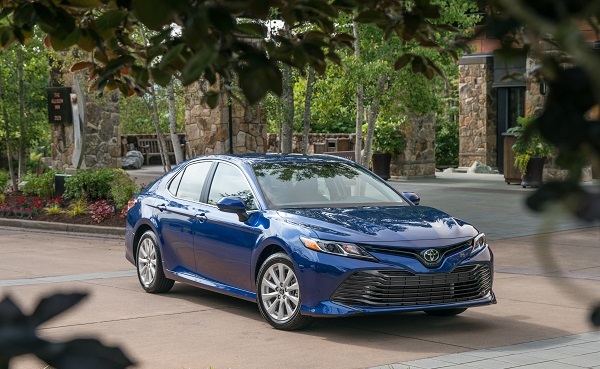 The looks are great, the new drivetrains are among the best in the business, and the Camry cannot be beaten for safety and value. 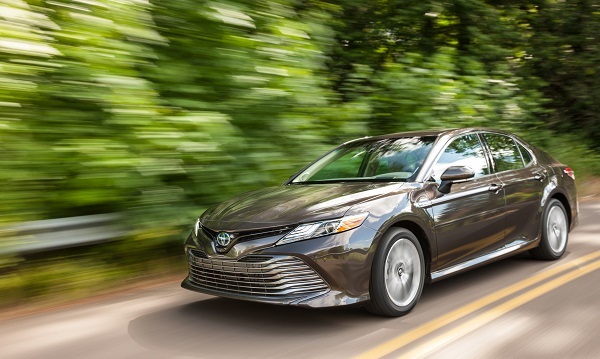 Our research also shows that Toyota has been keeping discounts and incentives strong on the new Camry, despite this being its first year of sales. Read the FULL REVIEW Now to get expert tips on the 2018 x’s exterior, technology, safety, reliability, pricing and more.